Ethiopian illegal immigrants wait on a beach for smugglers' boats to take them across the Gulf of Aden into Yemen. (CNN) -- At least 10 people being smuggled by boat died in the Gulf of Aden "after a two-day journey from Somalia to Yemen," the United Nations' refugee agency said Tuesday. "Ten Ethiopians suffocated en route to Yemen as the smugglers crammed and confined 25 people to the engine room with no ventilation," the Office of the U.N. High Commissioner for Refugees said. "Survivors claim that their bodies were thrown into the sea some seven hours after departure." There were reports that another four people reportedly died in waves, the agency said. This reportedly happened as "smugglers, fearing detection by the Yemeni navy, forced the remaining passengers to disembark too far from the coast. After the exhausting trip they were simply too tired to swim and succumbed to the rough sea." The Horn of Africa has been wracked by warfare, famine and political instability, conditions that have spurred flight. More than 9,000 Somalis and 27,000 Ethiopians have arrived in Yemen by boat so far this year. 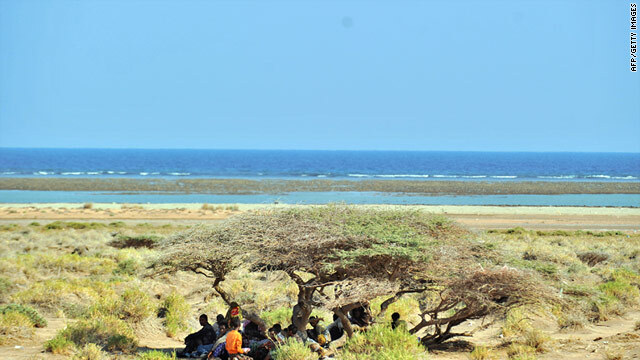 Some of the passengers found on Yemen's shore near Al Hamra said the smuggler's boat left Bosaso in the Puntland region of northern Somalia on Sunday. There were 101 survivors. "We condemn the unscrupulous and inhumane treatment of refugees and others who are desperately seeking to flee the violence, human rights abuses and seriously debilitating life options in the Horn of Africa," said Erika Feller, UNHCR's assistant high commissioner for protection. "We have witnessed similar, isolated, individual incidents before utter disregard for human life." The agency said 108 people "are known to have drowned or fallen victim to risky crossings on the Gulf of Aden since the beginning of the year.